“The Last Emperor’s” next opponent has been assigned. On Friday morning, M-1 Global announced Fedor Emelianenko (Pictured) will face former UFC heavyweight top contender Pedro Rizzo on June 21st. The veterans will battle inside Ice Palace in St Petersburg, Russia. Although an official report has yet to be made, the show is expected to air on pay-per-view. Emelianenko snapped his three-fight losing skid in November by posting an uneventful unanimous decision victory over Jeff Monson. The 35-year-old followed that up by quickly disposing of Satoshi Ishii on New Year’s Eve in Japan. 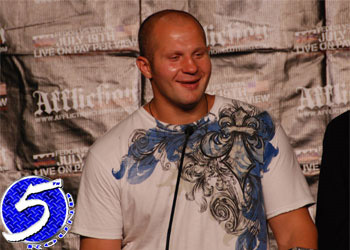 At one stage during his illustrious career, Emelianenko had rattled off 27 consecutive Ws. However, some will always question his credentials because he never competed in the UFC. Rizzo kicked off his mixed martial arts career nearly 16 years ago. “The Rock” fought for the UFC title on three occasions but came up short in each attempt. The 37-year-old hasn’t been seen since posting a TKO victory over Ken Shamrock in July 2010.